When we got back, I couldn't believe just how much we got done. We visited the prolific Walter Day of Twin Galaxies, three WR holders, visited Tim McVey who was in the middle of a 30+ hour marathon attempt of Nibbler (classic game by Rock Ola) and drove 800 miles in 48 hours. A massive amount of geekiness in such a short amount of time. Mark and I have been talking about this trip for sometime as he wanted to go and visit Walter Day of Twin Galaxies, a friend of his and keeper of many vintage arcade goodies. Mark's a bit of a video game historian with quite possibly the largest collection of historical artifacts about early competitive video gaming next to Walter's. 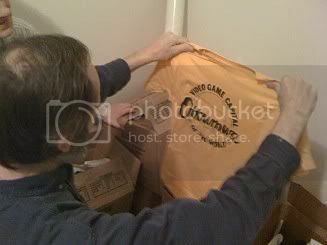 As Walter Day has sold Twin Galaxies and is donating a massive amount of material from TG to the arcade museum, Mark wanted to go there and talk with Uncle Walter (as he calls him) to pick up some goodies. On Friday night, Mark drove up from Kentucky and met me at my place with quite possibly the most amount of stuff I have ever seen anyone go on a road trip with. It took us three trips from him car to unload it all and when we were done, he was surrounded on my couch with a ton of gear including an air mattress, two pillows, bedding, two bags of food, a laptop and gear bag, a box of boards, two duffel bags of clothing, a pile of CAG goodies including King of Kong posters and DVD's and camera equipment with two tripods. 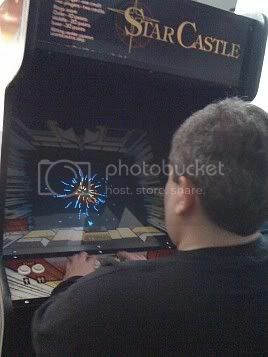 I have a Crystal Castles machine, one of only two classic arcades I own (the other being a vs. Nintendo cab for non-regular readers of this blog) and Mark is the former WR holder, so I definitely wanted to get some footage of him playing and also get a few tutorials as I am dying to hit 850K. Once we started playing, Mark noticed that I have a rare version of the CC board - the conversion board - which is a bug-fixed version with a different end screen (trapazoids instead of cubes) and a new credit screen. we took some archival footage of him playing to show the differences and the Mark took a number of runs at the game, hitting a high score of about 836K, which he wasn't too happy with. Pretty good for not playing in some time for sure, but whenever we had time, hed play a game or two to try and ramp up that high score. We actually ended up leaving late on Saturday because he wanted to get in a few more runs! We left my place at around 10 a.m. and headed up to DeKalb, home of Star Castles arcade, a hole-in-the-wall classic arcade where we met up with Paul Zimmerman, the current Phoenix WR holder. 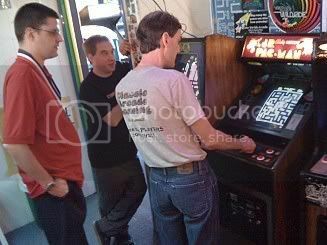 Paul and Mark talked it up for a while while I played Castlevania on a Playchoice cab and Stocker, a rare Bally/Sente game. After about an hour and a lot of picture taking by Mark and Paul, we split to make the long drive to Walter's place. One of the funny things about road trips is that you ened up learning a lot about the person you are in the car with. Mark was no exception. We talked a lot about the 1980's when he started competitively gaming, playing in some of the first tourneys in 1985 and on. 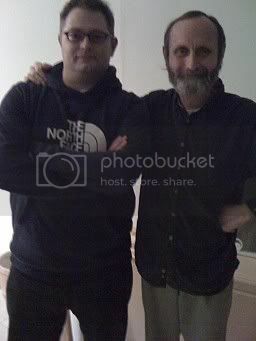 He met the current WR holder of CC and a good friend of his, Frank Seay at one of the Twin Galaxies tourneys and from there they started learning the game and perfecting patterns until Frank hit 910k+ and hit the new WR, which was never to be beaten. I also learned a lot about Mark's musical tastes as we played Name That Tune with music from his laptop with him choosing the songs and me having to guess. I learned that Mark really likes a number of pop hits from the 1970's to present with no exceptions for hip hop, metal or whatever. A typical string of songs would be from Green Day, ABBA, Hataway (What is Love), POD, Bob Seger, The Bangles, Eagles, Devo, and ELO. Needless to say, I didn't know a ton of them but we did have a bunch of fun. We hit Walter's place, an 1890's Amnityville style house late in the afternoon and hung out, going through old memorabilia and found mad amounts of stuff even he didn't know he had anymore, including the waivers from the infamous 1982 Life Magazine shoot, old score books from the 1980's original tourneys and one of the only remaining t-shirts Walter made celebrating Twin Galaxies home town of Ottumwa as the video game Capital of the World. Walter was a gracious host and a lot of fun. He asked me a lot about myself and my gaming history and made me feel right at home, standing in the center of gaming history. I even got a chance to see the office and studio Walter is filmed in in King of Kong where he one day wants to settle down and record some music. He rents out most of the house and only lives in two rooms in it - a small kitchen and a smaller bedroom. As he's big into transendental meditation, he doesn't seem to need a bunch of gear and he's really humble for a guy who has such an important place in video gaming history. I had Mark snap a quick shot of me and Walter as we left and carried out Mark's pile of goodies, including about 1000 Twin Galaxies arcade tokens and numerous other rule books, posters and promotional goodies. 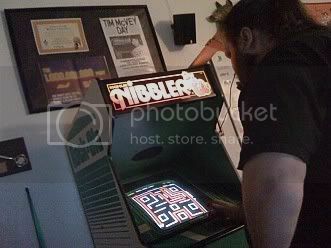 From Walter's we headed to Tim McVey's place where he was in the middle of a WR marathon attempt of Nibbler by Rock Ola, the first coin-op version of Snake. He made video gaming history in the early 1980's when he was the first to hit 1 billion points on a video game- in this case, Nibbler. His house has a bunch of memorabilia from that time, including a key to the City of Okaloosa, IA, his home town. He also use to be a prolific BMX racer in the 1970's and 1980's and has a wall of trophies and gear from that time. There was a room full of people there, helping him out and taking him through the long hours required to best the current WR. He took the time to talk with us, do an interview with Mark while playing and also watch some of the MMA fight on the big screen HD TV which took up a good deal of the front of the room. He started trying to recapture his record this year when some documentary filmmakers asked him to attempt it. Afer he had hit 1 billion on it in the 1980's, he had won a machine from Rock Ola as part of a promotion, but didn't really feel like playing much after the 30+ hour marathon game and it collected dust for years, finally being sold by Tim. The filmmakers decided to try and track a machine down for him and found one on eBay which just so happened to be the personal machine of one of the game's creators. They quickly snapped it up and had the two programmers sign it and gave it to Tim earlier this year. So far he's banked four or five attempts at the new record, only to be beaten back each time by fatigue and more often, his hand which would blister and bleed before coming close to finishing. Back in the 1980's , Tm was racing BMX and had massive calouses on his hands, so it wasn't a problem then, but now, as a 40+ year old, his hands can't take that abuse. He's tried gloves, which didn't work, and a few other things, finally getting the sound advice to cover the pads of his hands in Super Glue and wrap them in flexible athletic tape, which seemed to do th trick when we were there, 14 hours into the attempt about at almost 400 million points. We stayed for a bit, watching and recording and took off for Greg Laue's house, the former WR holder of Star Castle - Hard Chip version and home to a well-stocked personal arcade of about 30 classics, including Donkey Kong Gauntlet II, Pac-Man, Joust, Robotron, Tron, Star Wars and Elevator Action to name just a few. I played for as long as I could while Mark had instantly hit the sack when we arrived. Greg and I talked and played and my eyes started to cross at about 2:30 a.m. after a nearly 300K game of DK by Greg. In the morning we headed out for home and said goodbye to Iowa for the time being.Thanks to everyone along the way that opened their home to us, Greg of the comfortable couch and Mark for the stories and companionship. Great writeup! 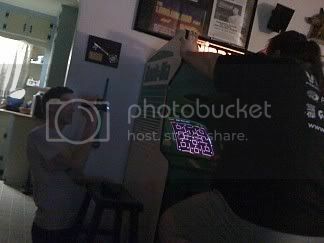 Awesome to get a glance of Jr. Pac-Man and Star Castle in action, as those were two personal favorites back in the day. I'll second that, excellent documentary style writing. Sounds like you had a real blast. Would love to see more footage. I was born and raised between Waterloo and Cedar Rapids, IA (just north of Ottumwa). So arcades were a big part of my life in the early 80's. 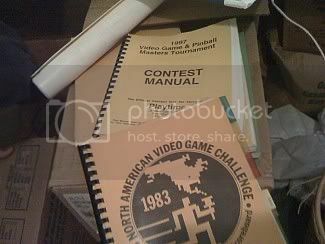 I had no clue about Twin Galaxies and all of the tourneys that took place there. Blows me away! IOWA?!?! Got some more footage of Mark playing CC comming. Thanks for the props all. Wish I got more footage from the other spots, but sadly I got none. seems like you had your hands full.. next time you need to bring someone who can just film everything for posterity. I know Steve Wiebi tried to get the record in Donkey Kong 'live' in 09, I can't help but think that the guys from the King of Kong get followed around by film crews every time they go for a record just for 'King of Kong 2'! Is Walter still running the TG scoreboard? As far as I know, he is only a small part if it. The scoreboard is done by other people. I think he only helps put out the posters and corral people together for events. He's an amazingly nice guy, but since he sold TG, he's just more on the periphery of the operation. And I'd love to see a 'King of Kong 2'. More than that, I'd love to see a documentry on Donald Hayes - the guy's a beast!